November 30, 2018 Robert W.
Trade Show pop up banners come in many sizes to match your needs. They are popular with vendors and people displaying at trade shows because they are inexpensive and very easy to set up. These banner stands can be set up in a couple of minutes and taken down in short time. Another advantage of trade show pop up banners is that they can be carried into the venue without the assistance of union labor, which is quite expensive. Trade show pop up banners can also be made to look like a large one unit display. Businesses will often design a very large display and simply cut it up into smaller sections and then place these smaller designs onto several banner stands ( of the same height and type) and then simply place the banner stands next to each other so that it looks like one very large graphic. Trade show pop up displays come in many sizes ranging from about 2 feet wide by about 6 feet wide. The heights vary from 78″ tall to almost 8 feet tall. They all come with an adjustable height pole that allows them to be adjusted for height and a convenient carrying case. These banner stands are lightweight and easy to transport and shipping can be arranged to your hotel. Many vendors prefer to have their trade show pop up banners made in Las Vegas to avoid any type of shipping issues such as lost or damaged goods. Another reason is that vendors prefer to know that their pop up stands are waiting for them in Vegas. November 27, 2018 Robert W.
Custom standing banner stands in Vegas can get you that customized or personalized retractable banner stand for your event or show. With the numerous events and shows in Las Vegas, banner stands are in high demand because they are a very popular display graphic at events. Custom standing banner stands can be made to your specific design, are very portable, as they can be placed anywhere indoors as they do not require any attachment for support. Custom standing banner stands come in many sizes to match your display needs at your event. One of the most popular size is the 33″ wide model that stands around 6.5 feet tall that has around 17 square feet of printable space on it. This 17 square feet can contain logos, any colors you like as well as pictures printed on it. Many customers place pictures of the goods and series they offer on these banner stands. In fact, by placing a couple of banner stands next to each other, it makes a very impressive display because it looks like one solid graphic. The benefits of splitting it up is that you can easily set these stands up in just a few minutes and disassemble them in short time as well, thus avoiding bulky displays that often require several people to set up. Custom standing banner stands do come in different sizes ranging from around 2 feet wide to around 5 feet wide and in different heights. One positive feature these stands offer is that they have an adjustable pole that allows for adjustment of height, so you do not need to have a graphic that matches exactly the size of the retractable banner stand. So if you have a 33″ x 81″ banner stand, you can place a 30″ wide by 75″ tall banner graphic in the stand and it will work just great. November 19, 2018 Robert W.
Standing banner retractable signs in Vegas are extremely popular during the long trade show and convention season. Standing banner retractable signs can be seen displayed all over the trade show venues because of their size, mobility and cost. Standing banner retractable signs are a very cost effective way to display your marketing signage at the shows. There are hundreds of trade shows and conventions in the Las Vegas area every single year attracting millions of visitors the Las Vegas area. People love coming to Las Vegas because it is such a fun city to visit and Vegas has the infrastructure in place to support millions of people with all the hotels and casinos. People consider it almost a vacation when they get to visit our city under the pretext of attending the events and shows of their industry. There is 24 hour fun, drinking, gambling, shows, golf, skiing during the winter and boating during the summer. Vegas is a fun place for your trade show or convention. Signs and banners are needed year round for these events as there are yearly conventions. One of the most popular display graphics is the standing banner retractable signs or also known as retractable banners. Standing banner retractable signs start off at less than one hundred dollars for the very popular 33inch wide models that stand around 7 feet tall. This equates to about 17 square feet of printable material that allows you to put a lot of information on the sign. The retractable banner stand can be full color with any combination of colors you choose as well included pictures and printed logos. They are very portable because they come with a convenient carrying case that allows them to be moved around quite easily. They are self standing and can be placed anywhere in your convention booth. June 13, 2018 Robert W.
Cheap banner stand displays work great for conventions and events in Las Vegas. Hundreds of events, trade shows and conventions occur yearly in Las Vegas and a cheap banner stand displays are one of the most popular graphics for these events. Partly because they are easy to set up, economical and are self standing. More information on their uses can be found at : http://blog.ideafit.com/blogs/cookandhealth/creative-signs-to-inspire-motivation . Las Vegas is a very popular destination for shows and events. Hundreds of trade shows and conventions bring hundreds of thousands of people to Las Vegas every year. Partly because Las Vegas is such a fun destination and there are so many things to do. In fact, business people attending the conventions often bring their families with them as sort of a vacation. Las Vegas in known for gambling, but Las Vegas has some of the best pools, arcades, theatres and shops in the world. In the summer there is boating and fishing at Lake Mead and in the winter there is skiing at nearby Mt. Charleston. It is a combination of mixing business with pleasure that makes Las Vegas a “Hot” destination for shows and events. 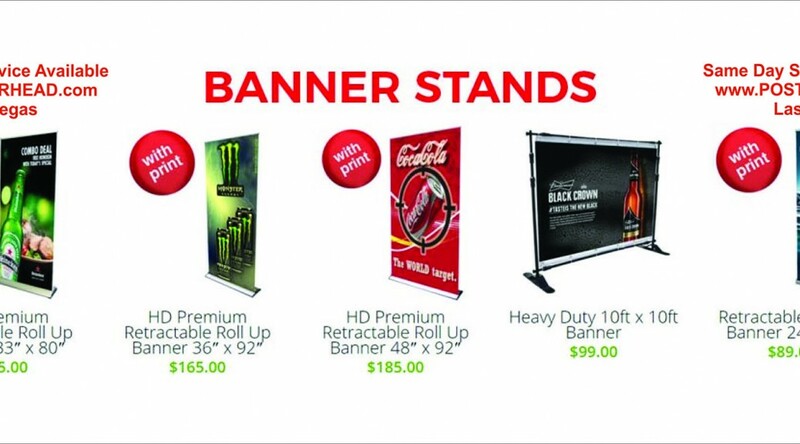 Cheap banner stand displays are economical in price and often they cost less than $100 for the more popular sizes. In addition, these retractable banners come in many sizes up to almost 5ft wide , which makes for a really impressive display. These banner stands are full color ( meaning you can have pictures and unlimited colors on the banner ) and a carrying case so that they are easy to tote around. They set up in a minute or less and can be taken down in the same amount of time and be used again at other events. Cheap banner stand displays are easily obtained at one of the many fine sign companies that service the conventions and trade show industry. 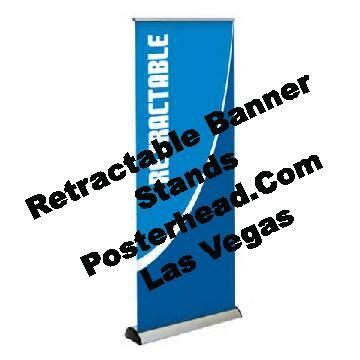 April 14, 2018 Robert W.
Retractable banner stand displays are quite popular with the convention people in Las Vegas. Las Vegas is the number one destination for trade shows and events in the world and retractable banner stand displays play a large part of the display graphics that are seen at these events. These retractable banner stand displays are very easy to set up and move around which makes for convenience of the exhibitor. The stands are very inexpensive and can be used at many different events, which makes them very economical. Retractable banner stand displays start off at less than $100 and in many cases, can be made the same day. One sign company in Las Vegas, Posterhead Signs , http://posterhead.com/posterhead-banners/ is located near the Las Vegas strip and can make the banner stands in a single day. They offer a wide variety of banner stand sizes and different substrates to print on for those stands. Sign companies in Las Vegas make many stand up banners yearly because of all the shows and events that take place in Las Vegas. These sign shops cater to the trade shows and conventions and offer banner stand sizes from 24″ wide all the way to about 5 feet wide. In addition, they can make and print large 10ft. tall banners that stretch 50 feet wide and use pipe and drape to hold the banners up , just like the famous Academy Awards or other Hollywood productions. There are many sign companies in Las Vegas that want your business and are willing to try harder to make your event a success. Contact a sign company in Las Vegas to help you with your stand up banners. These sign companies can be found online and checking with web referral sites like www.Yelp.com or Google can help you make sure you find the right sign company for your needs. March 23, 2018 Robert W.
Retractable banner stand sign company in Vegas are needed for those display graphics when presenting in Las Vegas in a meeting or at one of the convention centers. Retractable banner stands are on of the most popular display graphics at these events for a variety of reasons. 1. The banner stands are easy to set up and take down which makes them very portable. 2. Retractable banner stands come in a variety of sizes to accommodate your graphic display needs. 3. Retractable banner stands are very economical and represent a great value in signage. 4. Retractable banner stands take up very little room and can be set up independently of other signage. Retractable banner stands make a for a wonderful graphic display at business presentations because of their size and the ability to display large amounts of information on a compact frame that is easily carried from meeting to meeting. The banner stands all come with a easy carrying case that allows for easy transportation and set up time is less than a minute or so. Banner stands are also a great graphic display at trade shows and conventions where space is limited. In addition, these banner stands are economically priced so that you could potentially use them for just one show and throw them away and simply replace the graphics with new information for the next show. Starting off at less than one hundred dollars for a display stand with print graphic makes them a economical choice for presentations of your products and services. retractable banner stand sign company can be found by simply using your sell phone and searching for ” Banner Stands in Las Vegas”. Many results will come back, but make sure you use a sign company that has their own sign equipment like www.Posterhead.com . This allows for a quick banner stand in case one is needed at the last minute. May 4, 2016 Robert W.
Las Vegas custom pull up banners are very popular at the conventions and trade shows in Las Vegas. Las Vegas custom pull up banners are the number one most popular graphic at the trade shows because they are so portable and easy to set up. Many smaller companies and individuals exclusively use these pull up banners as their sole graphic display. Pull up banners are also known as retractable banners. They operate on the premise of extending the banner with a pole that allows for the banner to remain upright when extended and then retract into a aluminum canister for compactness. The retractable banner comes with a carrying case and a pole that all goes in nicely into a carrying case that is convenient and easy to travel with. Las Vegas custom pull up banners come in many sizes. The most popular size is the 33″ x 78″ tall retractable banner that sells for less than $100.00. There are many more sizes of pull up banners such as the 31″ x 81″, 47″ x 78″, 36″ x 78″ etc. Many times, a small company or individual will place three of these retractable banners side by side so as to actually make it look like one very large graphic. When putting several together, they can form close to a 10 foot long graphic that is very impressive. Las Vegas custom pull up banners are full color, meaning you can have as many colors on the banners as you want. This includes pictures and logos as well. These pull up banners will last for many trade shows and conventions. There are many sign shops and print shops in the Las Vegas area that can assist you in obtaining your graphics at a discount price. They can be purchased very cheaply and then picked up in Las Vegas for your show for convenience. Contact a local sign shop to see how they can help you with your pull up graphics.